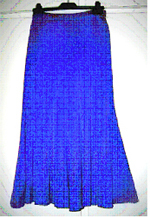 Knitted in 3 strands of Fine crepe on the standard gauge machine, a re-make on a popular Hobby skirt with small kick pleats running round the hemline. 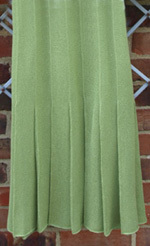 Single bed standard gauge skirt knitted sideways with 3 strands of Metro Crepe or Yeoman Yarns Fine Crepe. Lots of short rows give the hemline a more than circular flute. Extremely popular pattern. Finished skirt weighs 600 grms 38 inch hip. 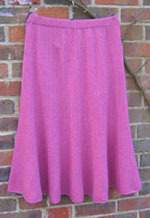 Single bed standard gauge skirt knitted sideways with 2 strands of Undys Crimpio. 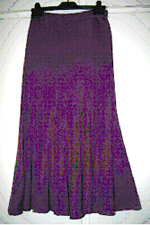 This skirt has half as many short rows giving the hemline an easy flare. Extremely popular pattern. The skirt will come out of one 500grm cone but your are knitting 2 strands of yarn. Up to 48 inch hip. 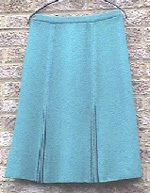 A very popular skirt knitted in 2 strands of Hobby with easy to press pleats. Skirts can easily be altered to any length by increasing or reducing your stitches ! up to 50 inch hip. Contact Ann for Hobby, she still has some in stock ! !